Christie®, a leader in creating and delivering the world’s best visual and audio experiences, is delivering leading-edge cinema solutions for the best movie-viewing experience at CineAsia 2017, taking place at the Hong Kong Convention and Exhibition Centre, December 12-14. The prestigious event, which brings together professionals from across the film industry, including cinema owners, suppliers, film buyers and distributors, is the only Pan-Asian convention dedicated to the cinema exhibition and distribution communities in the region. At booth #B201, Christie is presenting a broad lineup of its latest offerings, including the introduction of its new direct-coupled RGB pure laser projector using our latest CineLife™ image processing technology, as well as innovative audio and lobby solutions that offer the best and the most complete cinematic experience to movie-goers. The main highlight is the official launch of the Christie CP4325-RGB pure laser cinema projector, which delivers a premium movie-going experience to mainstream theatres. Featuring CineLife™ electronics and RealLaser™ illumination, this compact, all-in-one DCI-compliant projector excels in image quality and operational lifetime, while providing a low cost of ownership. Boasting a much higher efficiency than RGB lasers used in current cinemas, the CP4325-RGB does not require sub-ambient cooling (i.e., no ‘chillers’ required) and has a compact form factor, all-in-one design. Providing superior color, higher contrast, a future-proof design and low maintenance, it offers the most authentic and immersive cinema experience for the mainstream market and is an ideal replacement product for exhibitors wishing to upgrade existing installations, as well as for new-build cinemas and retrofits. Visitors can partake in live demonstrations of the CP4325-RGB in a custom-built internal theater at the booth, and experience how Christie’s fully integrated RealLaser illumination technology can accurately and efficiently produce light for mainstream cinema applications, which outperforms any cinema projector in its class with far superior image quality, over 20,000 lumens and more than three times the contrast ratio of existing systems. 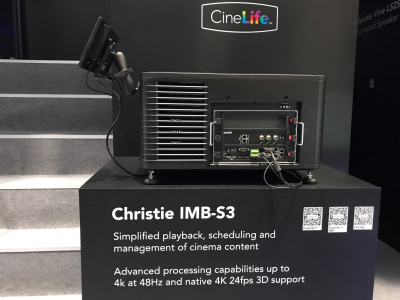 Christie’s new CineLife™ Series 3 cinema electronics will be showcased at the booth with a static display of a Christie CP2308 digital cinema projector – the first cinema solution equipped with this new platform. Featuring a streamlined UX-designed interface that simplifies the playback, scheduling and management of cinema content, Christie CineLife is manufactured, designed and integrated into Christie’s range of DCI-compliant projectors. When equipped with the optional Christie IMB-S3, Christie CineLife offers a tightly integrated Screen Management System (SMS), enabling seamless content and booth management with its built-in automation controller. CineLife electronics-equipped projectors also have an expansion card slot to support various add-on cards while providing a future-proofed solution. 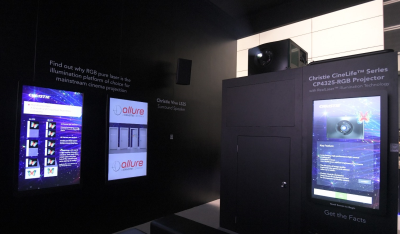 Another highlight at the booth is Christie Vive Audio, the world’s first audio system featuring Christie’s advanced wall and ceiling surround speakers, which are powered by unique, ribbon-driver technology in a parabolic line array design, purposely built for the cinema environment. Products showcased include the LS1 line source loudspeakers, LS2S surround speakers and S218 subwoofer, which are set up for audio demonstrations that complement the stunning visuals projected by the new CP4325-RGB pure laser projector. The Christie Vive Audio system provides a hyper-accurate audio experience and unlocks the full dynamic range of the DCI digital cinema audio and supports leading formats such as Dolby® Atmos™, 7.1 and 5.1 surround sound. Featuring planar ribbon driver technology with its low distortion and superior transient response characteristics, the LS Series screen channels at the booth are single-enclosure designs ideal for most 5.1 and 7.1 distributed sound applications. Christie Vive Audio system continues to establish its reputation worldwide as the next standard in immersive sound for cinema. 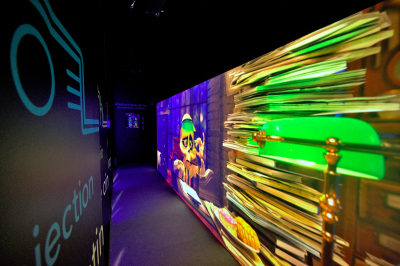 Guests can also check out the inventive “Christie Corridor” – a full-sized immersive cinema passageway similar to those found in contemporary theater complexes. Designed to enhance customers’ pre-show experience, it comprises large extended screens displaying an array of cinema-related contents using three Christie Captiva DHD400S ultra short throw projectors, Christie Pandoras Box media players and the new Christie Terra SDVoE technology solution. 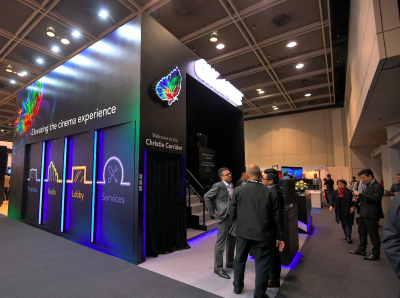 This is the first time that the Christie Terra – which represents an all-new AV solution enabling the transport, processing and control of audiovisual content, including 4K@60Hz video formats, over 10G Ethernet networks – is showcased at CineAsia.